BLOG: Has slap bass become socially acceptable? 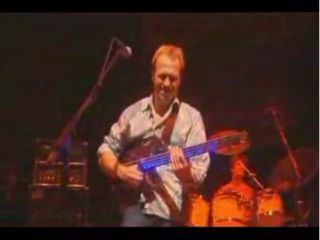 Happy slapping: Mark King goes off on one. Boogie woogie piano may have its share of haters, but no playing style inspires loathing like slap bass. Showy, pretentious and preposterously 'muso', for many people, it's simply beyond the pale. Personally, I've never been offended by slapping - in fact, I'd go as far as to say that, when used in the right musical circumstances, I rather like it. I've frequently invited ridicule by admitting that I'm partial to a bit of pre-Running In The Family Level 42 - though I draw the line at Mark King solos - and I can only tolerate Red Hot Chili Peppers when Flea turns on the funk. Then there's Larry Graham, the godfather of slap, whose playing on Sly And The Family Stone's Thank You (Falettinme Be Mice Elf Agin) is exemplary. I know I'm in the minority though, which is why I've been surprised to hear that slap bass seems to be making something of a comeback. Sam Sparro's latest single, 21st Century Life, positively reeks of it, as does Justice's DVNO. In fact, it seems to be dance music producers who are now at the vanguard of slapping, which makes me wonder if we've now entered the post-modern era of its use. Hear the technique on a contemporary house/disco record and it almost seems to come accompanied by a knowing wink, with the artist being well aware of the negative connotations associated with the sound. Whether it's being used ironically or sincerely, though, I'm just glad that slap is back. That said, even I'll admit that the incidental music in Seinfeld is vile.